adapted to fit the new model of a long magnet made by an array of magnetic dipoles instead of the original model of a single magnet dipole. When a long magnet falls through a ring, current is induced in the ring. This phenomenon is called electromagnetic induction. According to Faraday’s law, the induced emf is proportional to the negative of the rate of change of magnetic flux Φ. The direction of the induced current is determined by Lenz’s law, the induced current produces magnetic field which tends to oppose the change in magnetic flux that induces such currents. 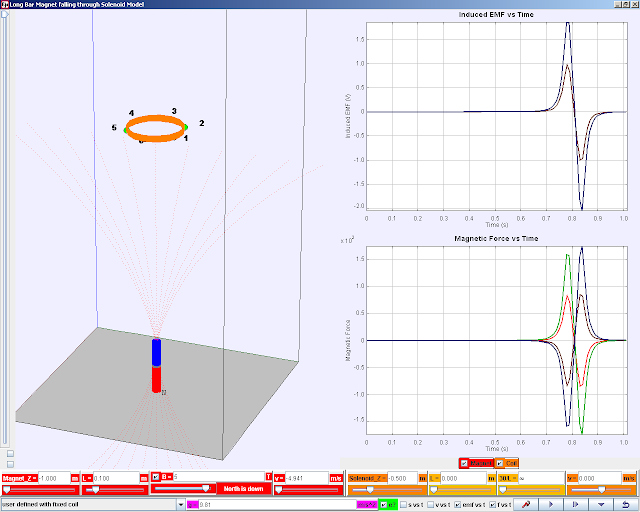 The voltage induced when a magnet is falling through a ring is simulated in this experiment, where we model the magnet as a vertical set of magnetic 'dipoles'. The current is visualized by very big 'electrons' that move according to the strength of the current. Explain the shape (positive and negative peaks) of the recorded signal. Why the peaks are not symmetric? At which moment was the magnetic flux changing most quickly? What was the total change of magnetic flux during the first half of the magnet’s fall - while it was moving in to the coil? What was the total change of magnetic flux during the second half of the magnet’s fall - while it was moving out of the coil? How could you change the simulation to increase the magnitude of the sign? The original simulation was created as part of the MOSEM2 project. http://www.compadre.org/osp/items/detail.cfm?ID=10327 Magnet Falling Through Ring Model written by Maria Jose Cano, Ernesto Martin & Francisco Esquembre. Maria Jose Cano, Ernesto Martin & Francisco Esquembre, lookang, sze yee.